Our smallest duck returns from the north! Buffleheads have returned for the winter, down from the boreal forests of the north where they breed. These birds are monogamous and often return to the same wintering area. 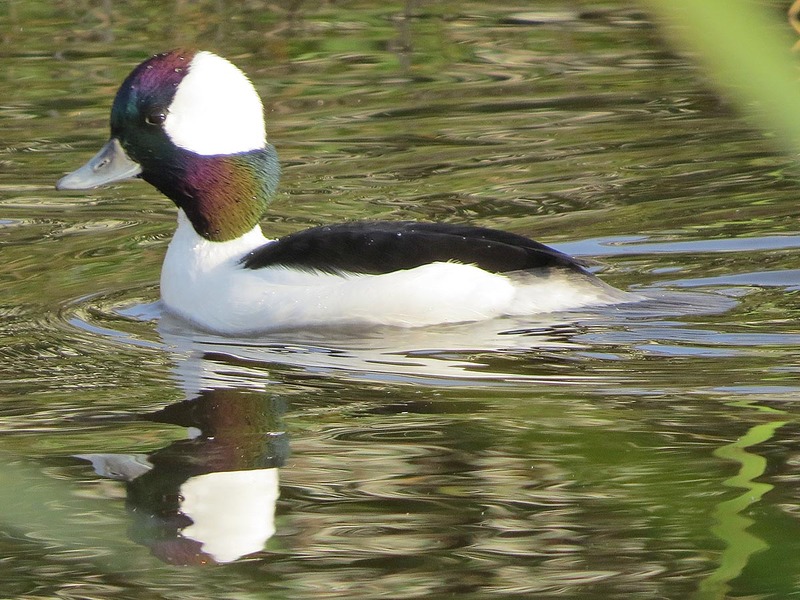 Buffleheads breed on small lakes and ponds in the boreal forest. 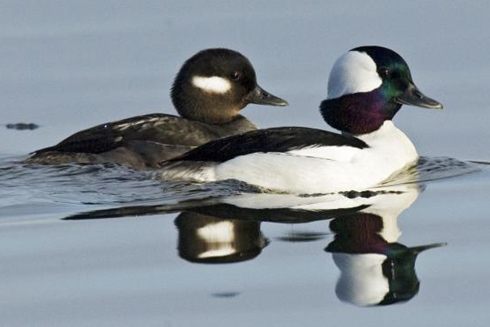 In winter, the Bufflehead is most often found in coastal areas, in shallow bays and inlets. Be sure to watch the video of Buffleheads—two males and one female. Picture yourself beside the ocean in winter. You’re bundled up and scanning the horizon where gathering dark clouds mark a rain squall on its way. The wind is brisk and big waves crash before you. [Crash of waves] You feel alone, and so it seems. But tonight, when you’re back in your warm house, they’ll sleep on the rough water. And ‘though some live past ten years, the average lifespan of a Bufflehead is less than three. How remarkable their ability to survive even one winter in what seems to us such an unforgiving environment! Bufflehead landing on water provided by the Macaulay Library at Cornell Lab of Ornithology, Ithaca, New York, recorded by W.W.H. Gunn.